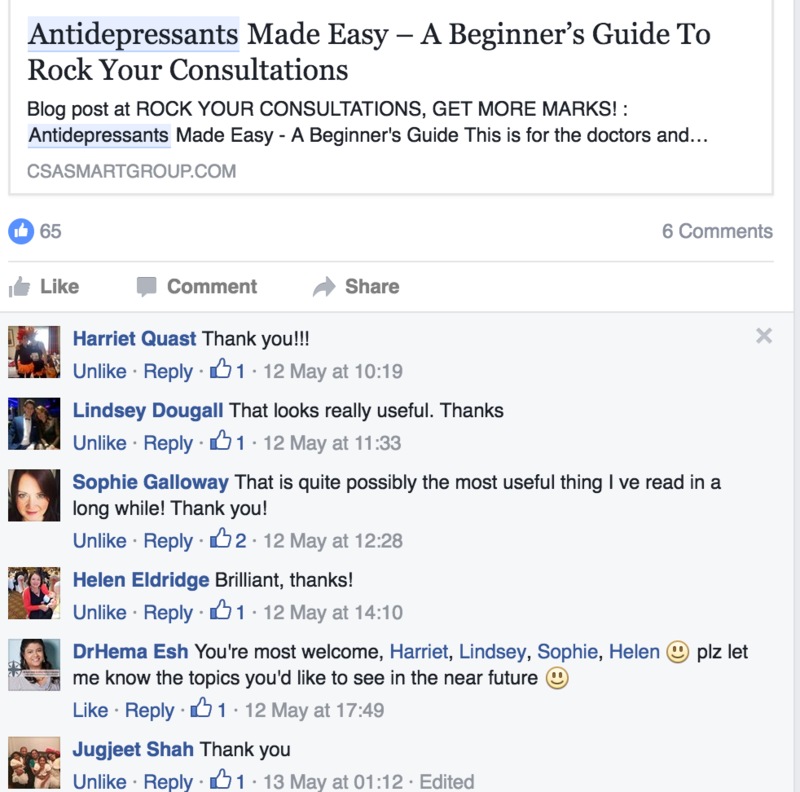 Antidepressants Made Easy – A Beginner’s Guide To Rock Your Consultations « ROCK YOUR CONSULTATIONS, GET MORE MARKS! 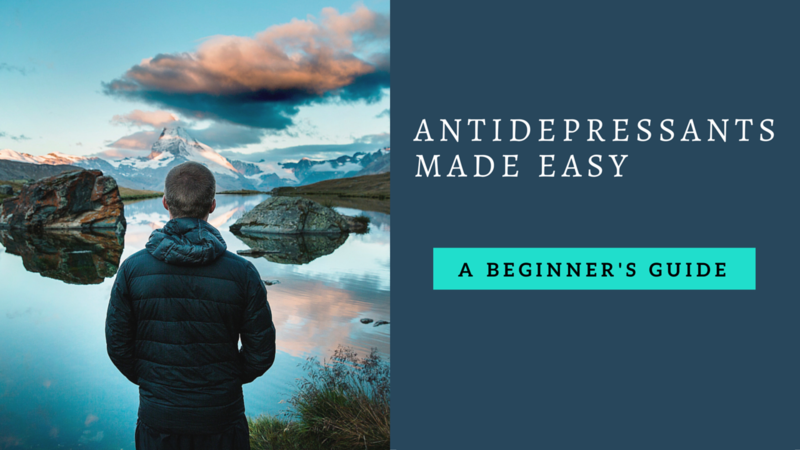 This is for the doctors and medical students who want to know the latest NICE guidelines about the antidepressants treatment in adults in an easy way. 1. How antidepressants work, why they are prescribed, their effects and side-effects, and alternative treatments. 4. The patient-friendly way to answer the most common questions asked by the patients. 5. Some example cases, references and sources of further information are added at the end of this webinar. Thank you for your lovely comments, Friends! 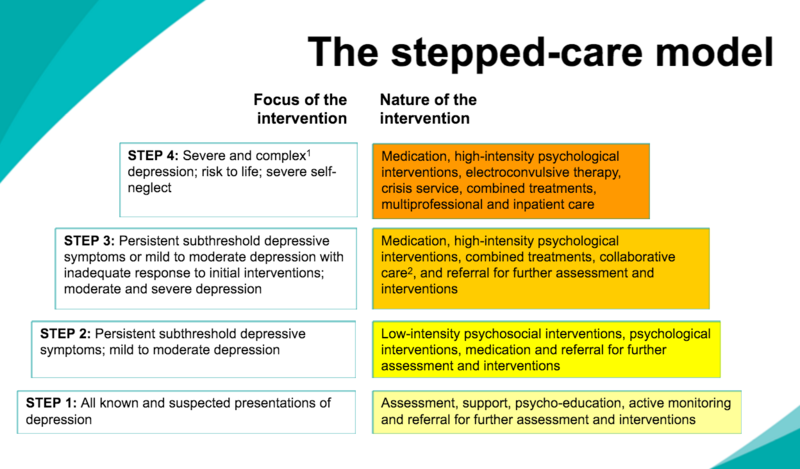 It would be useful, however, to remember that the depression is a bio-psycho-social illness and the first priority of assessment and management of it needs to be understanding it’s psychological and social precipitating and perpetuating factors and addressing these. Patient Health Questionnaire (PHQ-9): this is a nine-item questionnaire which helps both to diagnose depression and to assess severity. It is based directly on the diagnostic criteria for major depressive disorder in the Diagnostic and Statistical Manual – Fourth Edition (DSM-IV). It takes about three minutes to complete. Scores are categorised as minimal (1-4), mild (5-9) , moderate (10-14), moderately severe (15-19) and severe depression (20-27). It can be downloaded free from the internet. Hospital Anxiety and Depression (HAD) Scale: despite its name, this has been validated for use in primary care. It is designed to assess both anxiety and depression. Interview-based tools (such as Kiddie – Sads and Child and Adolescent Psychiatric Assessment) can be used for children and young adults suspected of having depressive illness. The Center for Epidemiological Studies Depression (CES-D )Scale and Reynolds’ Adolescent Depression Scale (RADS) are more suitable for adolescents. The Edinburgh Postnatal Depression Scale (EPDS) – a self-rating scale – is for puerperal depression. The Geriatric Depression Scale (GDS) is suitable for older patients. The Cornell Scale for Depression in Dementia (CSDD) is suitable for patients with dementia. When an antidepressant is to be prescribed, it should normally be a SSRI in a generic form because SSRIs are equally effective as other antidepressants and have a favourable risk–benefit ratio. SSRIs are associated with an increased risk of bleeding, especially in older people or in people taking other drugs that have the potential to damage the gastrointestinal mucosa or interfere with clotting. In particular, consider prescribing a gastroprotective drug in older people who are taking non-steroidal anti-inflammatory drugs (NSAIDs) or aspirin. Take into account toxicity in overdose when choosing an antidepressant for people at significant risk of suicide. The specific cautions, contraindications and monitoring requirements for some drugs. For people started on antidepressants who are not considered to be at increased risk of suicide, normally see them after 2 weeks. See them regularly thereafter, for example at intervals of 2 to 4 weeks in the first 3 months, and then at longer intervals if the response is good. SSRIs are associated with an increased risk of bleeding. Consider prescribing a gastroprotective drug in older people who are taking NSAIDs or aspirin. Fluoxetine, fluvoxamine and paroxetine have a higher propensity for drug interactions. For people who also have a chronic physical health problem, consider using citalopram or sertraline. as these have a lower propensity for interactions. Paroxetine is associated with a higher incidence of discontinuation symptoms. The increased likelihood of the person stopping treatment because of side effects, and the consequent need to increase the dose gradually, with venlafaxine, duloxetine and TCAs . 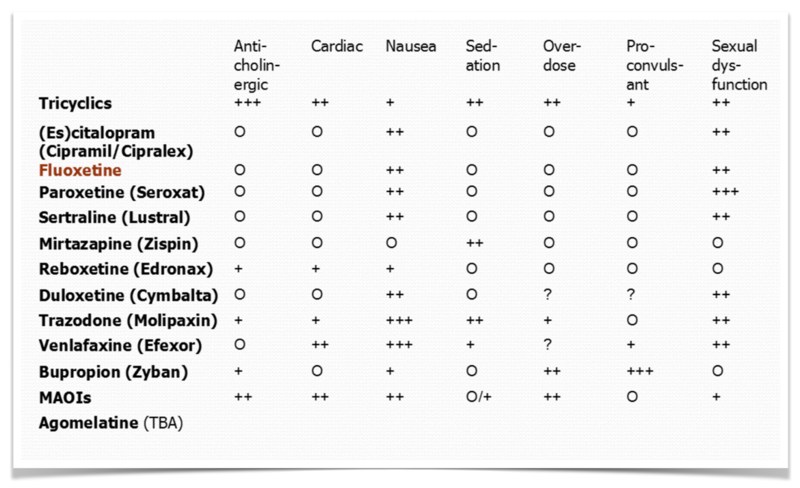 The specific cautions, contraindications and monitoring requirements for some drugs . Non-reversible MAOIs, such as phenelzine, combined antidepressants and lithium augmentation of antidepressants should normally be prescribed only by specialist mental health professionals . If a person with depression develops side effects early in antidepressant treatment, provide appropriate information. People who start on low-dose TCAs and who have a clear clinical response can be maintained on that dose with careful monitoring. If the person’s depression shows no improvement after 2 to 4 weeks with the first antidepressant, check that the drug has been taken regularly and in the prescribed dose. If the person’s depression shows some improvement by 4 weeks, continue treatment for another 2 to 4 weeks. Why discontinue or switch antidepressants? When switching to another antidepressant, be aware that the evidence for the relative advantage of switching either within or between classes is weak. Advise people with depression who are taking antidepressants that discontinuation symptoms may occur on stopping, missing doses or, occasionally, on reducing the dose of the drug. Explain that the symptoms are usually mild and self-limiting over about 1 week, but can be severe, particularly if the drug is stopped abruptly. When stopping an antidepressant, gradually reduce the dose, normally over a 4-week period, although some people may require longer periods, particularly with drugs with a shorter half-life (such as paroxetine and venlafaxine). This is not required with fluoxetine because of its long half-life. Inform the person that they should seek advice from their practitioner if they experience significant discontinuation symptoms. As set out in the introduction to this guideline, the assessment of depression is based on the criteria in DSM-IV. Assessment should include the number and severity of symptoms, duration of the current episode, and course of illness. Marked loss of interests or pleasure. At least one of these, most days, most of the time for at least 2 weeks. Ideally, patients admitted to the acute trust should be maintained on current therapy unless there are compelling reasons to change. A syndrome caused by over stimulation of serotonergic mediated enervation in the CNS. Combinations of antidepressants either deliberately or accidentally may cause SS. Onset is usually within a few hours of dose changes and can resolve quickly on dose reduction or cessation once symptomology recognized. At least 3 mental state changes, agitation or restlessness, sweating, diarrhoea, fever, hyperreflexia, tachycardia, myoclonus, lack of co­ ordination, shivering and tremor. Nausea, vomiting, tachycardia, hypertension and convulsions have been reported. Rule out other causes of these symptoms such as infection, substance misuse or withdrawal or neuroleptic malignant syndrome. Rule out other causes of these symptoms such as infection, substance misuse or withdrawal or neuroleptic malignant syndrome. Advise use of antidepressants for at least 2 years. the consequences of relapse are likely to be severe. After 2 years, re-evaluate treatment with the person, taking into account age, comorbidities, and other risk factors; thereafter re-evaluate as regularly as needed. · Numbers indicate the number of days to leave between the last dose of the first antidepressant and starting the new antidepressant drug. · Zero indicates that one drug should be withdrawn completely before starting a new drug, but no wash out period is required. · CT = Cross Taper, this indicates that drugs can be swapped by cross tapering over a few weeks. · c = Beware interactions with Fluoxetine may still occur for 5 weeks after stopping Fluoxetine because of long half­ life. · e = Withdrawal effects seem to be more pronounced. Slow withdrawal over 1­3 months may be necessary. 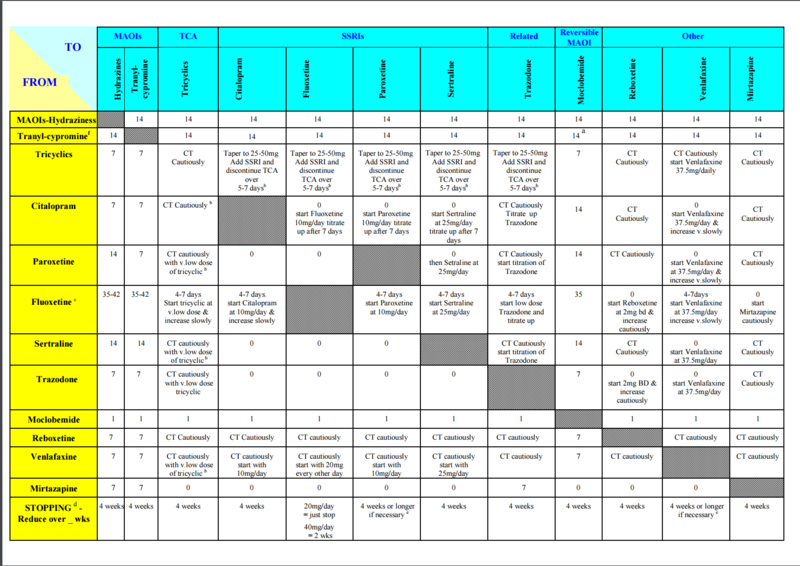 MIMS – Antidepressants, a Guide to Switching and Withdrawing – Click here! For additional considerations on the use of antidepressants and other medications (including the assessment of the relative risks and benefits) for women who may become pregnant, please refer to the British national formulary and individual drug summaries of product characteristics (SPCs). Refer to appendix 1 of the BNF and appendix 16 of Depression in adults with a chronic physical health problem for information on drug interactions. Q1: A 39-year-old woman has been taking Fluoxetine 20 mg for mod-severe depression for 2 months. She feels better and now wishes to stop. What’s best? Q2: A 70 years old lady comes to see you 3 weeks after her husband’s death. You notice she looks depressed. She reports poor sleep , appetite, loss of pleasure in activities and feelings of depersonalisation. What would you suggest? Q3: A 30-year-old female patient has been taking citalopram 40 mg daily for 4 weeks for moderate to severe depression. She doesn’t feel there’s much improvement. She has suicidal thoughts but they are transient. She has a history of a drug overdose. She has refused psychological treatment. Select the single most management option. You are George Bush, a 60-year widower. You feel suicidal and have come today to ask for some sleeping tablets. You plan to commit suicide by taking these with a bottle of sherry. You have not been sleeping well for the last 6 months and open with the statement ‘ I wonder if you could give me some sleeping tablets’. You have tried some tablets from the chemist such as Nytol and Kalms but nothing seems to work. You have also been trying to read or have a glass of sherry before bed to help you doze off. You feel desperate to get a good nights sleep. You go to sleep about 11pm but then wake at about 2 am and then cannot get back off to sleep. You do not sleep during the day. You lost your wife 9 months ago to lung cancer and miss her terribly. You live alone, and have 2 daughters but they live in Spain. You do the cooking, housework and garden yourself but over the past couple of months, you can’t be bothered with it. You cannot work because of your COPD but your finances are adequate to cover your living costs. You used to work as a lawyer, you feel useless because you can’t work anymore. You feel you’re ‘no good for anything’. You have lost your appetite and your clothes have got loose so you think you’ve lost weight. You can’t seem to concentrate on reading the paper or watching tv anymore. You used to meet your friends at the snooker club each week but you haven’t been bothered for months now. You do not smoke anymore. You have not made any attempts to harm yourself but have been thinking about taking tablets. You were coming today to get some sleeping tablets so you could take them all with a bottle of sherry, you feel like you’ve just had enough and want to end it all. When the doctor suggests you see the psychiatry team today you agree as you say you realise you need some help. This is an example of a depression consultation. The candidate is expected to identify this gentleman as depressed and to screen him for suicidal thoughts and risk. This consultation gives the candidate an opportunity to demonstrate their interpersonal skills. A good candidate will show empathy and understanding coming to a shared management plan. Same day referral is expected. • Failure to identify active suicidal ideation and make an appropriate referral for same day assessment. This case assesses the candidate’s understanding and management of depression and suicidal ideation. • Depression is found in 10% of those aged over 60. Depression in this group is associated with an increased mortality and is more often missed than in younger groups. • A history of depression, suicide attempt, or any form of abuse (sexual, physical, or substance). • Significant physical illness (such as coronary heart disease, diabetes, chronic pain). • Other mental health problems, such as dementia. • A family history of depression. • Other potential clues, such as frequent visits to the GP or emergency department. • Recurrent thoughts of death, suicidal thoughts, or actual suicide attempts (actively seek out symptoms by asking about suicidal thoughts and current intent i.e. ‘Do you ever think about suicide’, Have you made any plans for ending your life’). • Feeling down, depressed, or hopeless. • Having little interest or pleasure in doing things? Positive responses to both questions is 97% sensitive and 67% specific for depression. • Sleep hygiene (avoid stimulants e.g. caffeine, nicotine, use bedroom only for sleeping, quiet period 30min prior to bed, avoid sleeping in the daytime, write worries down on to do list before bed time) and anxiety management. • Exercise (3 sessions per week of moderate duration i.e. 45 minutes to 1 hour for between 10 and 12 weeks). Selective Serotonin Reuptake Inhibitors (SSRIs) are the first-line antidepressants (better tolerated, less side effects than tricyclics). 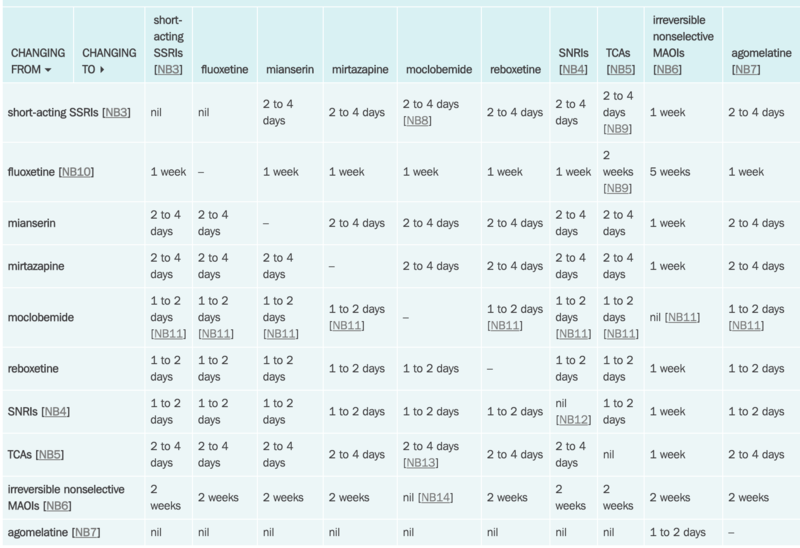 SSRIs should be stopped gradually (over a 4 week period) due to the risk of withdrawal symptoms/recurrence of low mood. Effects are no greater than placebo in mild depression (PLoS Medicine Feb 2008 meta-analyses). Sertraline is the most effective and has least side effects – citalopram is almost as good. CBT should be considered for patients with recurrent depression who have relapsed despite antidepressant treatment, or who express a preference for psychological interventions. A combination of CBT and antidepressants is recommended for severe depression. Suicide risk should be assessed at each appointment and documented. If patients fail to attend appointments they should be followed up. Two-thirds of suicide cases visit the GP in the month prior to suicide. • Advise on how to access support if their situation deteriorates. Be alert to the presence of depression, particularly in high-risk groups. Two point depression screening is a useful tool.